Some of the girls were the official beauty queens from their country some were not. 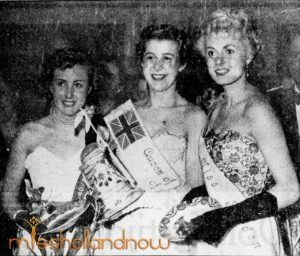 Vera Marks was the official Miss Germany 1951 also Lucienne Zadvorny from Belgium was the official Miss Belgium form 1951 as was our own Miss Holland 1951 Betty van Proosdy. Judy Breen who represented the UK was in fact Miss Festival of Britain 1951. There was even 1 girls who represented not a country but a city, Denise Le Mentec was Miss Cannes. But the girl who would be remembered the most, not because she became 1st runner-up at this pageant but because she became a famous movie start was Miss Sweden, Anita Ekberg. She was also the official Miss Sweden 1951. Anita became legendary for the scene from “La Dolce Vita” where she is walking through the Trevi Fountain in Rome. In 1956 she won a Golden Globe for Most promising newcomer for her part in the 1955 movie Blood Alley. There are not many publications on this pageant in the Netherlands. But I think we can be proud anyway! (on the picture above: from left to right: Miss Spain, Miss Germany, Miss Britain, Miss Switzerland, Miss Sweden , Miss Cannes, Miss Denmark, Miss Belgium, Miss Austria and Miss Holland.